Published: Jan. 20, 2019 at 04:54 p.m. Updated: Jan. 20, 2019 at 11:12 p.m. The Patriots and Rams punched their tickets to Super Bowl LII in thrilling title games. Take a look at all the best photos. 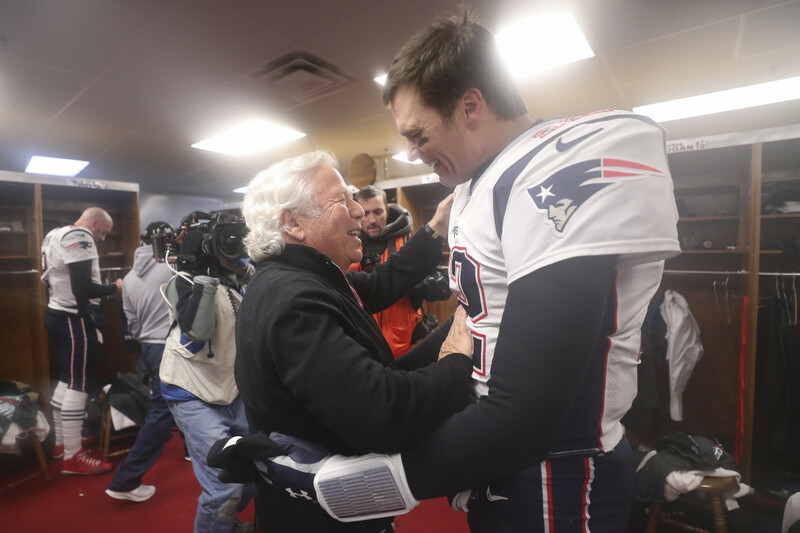 New England Patriots owner Robert Kraft celebrates with quarterback Tom Brady (12) following the NFL AFC Championship football game against the Kansas City Chiefs, Sunday, Jan. 20, 2019 in Kansas City, Mo. New England Patriots quarterback Tom Brady (12) celebrates following the NFL AFC Championship football game against the Kansas City Chiefs, Sunday, Jan. 20, 2019 in Kansas City, Mo. New England Patriots tight end Rob Gronkowski (87) runs the ball during the NFL AFC Championship football game against the Kansas City Chiefs, Sunday, Jan. 20, 2019 in Kansas City, Mo. New England Patriots quarterback Tom Brady (12) celebrates with running back Sony Michel (26) during the NFL AFC Championship football game against the Kansas City Chiefs, Sunday, Jan. 20, 2019 in Kansas City, Mo. Kansas City Chiefs running back Damien Williams (26) scores a touchdown during the NFL AFC Championship football game against the New England Patriots, Sunday, Jan. 20, 2019 in Kansas City, Mo. New England Patriots wide receiver Chris Hogan (15) catches a pass during the NFL AFC Championship football game against the Kansas City Chiefs, Sunday, Jan. 20, 2019 in Kansas City, Mo. Kansas City Chiefs running back Damien Williams (26) celebrates a touchdown during the NFL AFC Championship football game against the New England Patriots, Sunday, Jan. 20, 2019 in Kansas City, Mo. New England Patriots running back Sony Michel (26) celebrates during the NFL AFC Championship football game against the Kansas City Chiefs, Sunday, Jan. 20, 2019 in Kansas City, Mo. Kansas City Chiefs quarterback Patrick Mahomes (15) throws a pass during the NFL AFC Championship football game against the New England Patriots, Sunday, Jan. 20, 2019 in Kansas City, Mo. New England Patriots running back Sony Michel (26) runs the ball during the NFL AFC Championship football game against the Kansas City Chiefs, Sunday, Jan. 20, 2019 in Kansas City, Mo. New England Patriots quarterback Tom Brady (12) celebrates with center David Andrews (60) during the NFL AFC Championship football game against the Kansas City Chiefs, Sunday, Jan. 20, 2019 in Kansas City, Mo. Kansas City Chiefs defensive back Eric Berry (29) celebrates a stop on 4th down during an NFL football game against the New England Patriots, Sunday, Jan. 20, 2019 in Kansas City, Mo. Kansas City Chiefs safety Daniel Sorensen (49) runs after an interception during the NFL AFC Championship football game against the New England Patriots, Sunday, Jan. 20, 2019 in Kansas City, Mo. Kansas City Chiefs wide receiver Tyreek Hill (10) catches a pass during the NFL AFC Championship football game against the New England Patriots, Sunday, Jan. 20, 2019 in Kansas City, Mo. Los Angeles Rams quarterback Jared Goff (16) celebrates with punter Johnny Hekker (6) following the NFL NFC Championship football game against the New Orleans Saints, Sunday, Jan. 20, 2019 in New Orleans. Los Angeles Rams quarterback Jared Goff (16) celebrates following the NFL NFC Championship football game against the New Orleans Saints, Sunday, Jan. 20, 2019 in New Orleans. Los Angeles Rams running back Todd Gurley (30) and defensive end Aaron Donald (99) celebrate following the NFL NFC Championship football game against the New Orleans Saints, Sunday, Jan. 20, 2019 in New Orleans. Los Angeles Rams wide receiver Robert Woods (17) celebrates following the NFL NFC Championship football game against the New Orleans Saints, Sunday, Jan. 20, 2019 in New Orleans. Los Angeles Rams defensive end Aaron Donald (99) and nose tackle Ndamukong Suh (93) celebrate following the NFL NFC Championship football game against the New Orleans Saints, Sunday, Jan. 20, 2019 in New Orleans. Los Angeles Rams quarterback Jared Goff (16) greets New Orleans Saints quarterback Drew Brees (9) following the NFL NFC Championship football game, Sunday, Jan. 20, 2019 in New Orleans. Los Angeles Rams cornerback Marcus Peters (22) and strong safety John Johnson (43) celebrate during the NFL NFC Championship football game against the New Orleans Saints, Sunday, Jan. 20, 2019 in New Orleans. Los Angeles Rams strong safety John Johnson (43) makes a catch for an interception during the NFL NFC Championship football game against the New Orleans Saints, Sunday, Jan. 20, 2019 in New Orleans. Los Angeles Rams running back Todd Gurley (30) scores a touchdown during the NFC Championship Game against the New Orleans Saints, Sunday, Jan. 20, 2019, in New Orleans. New Orleans Saints running back Alvin Kamara (41) runs the ball during the NFC Championship Game against the Los Angeles Rams, Sunday, Jan. 20, 2019, in New Orleans. Los Angeles Rams quarterback Jared Goff (16) looks to throw a pass during the NFL NFC Championship football game against the New Orleans Saints, Sunday, Jan. 20, 2019 in New Orleans. New Orleans Saints wide receiver Michael Thomas (13) catches a pass over the Los Angeles Rams' Cory Littleton (58) during the NFC Championship football game, Sunday, Jan. 20, 2019, in New Orleans. New Orleans Saints running back Alvin Kamara (41) runs the ball as Los Angeles Rams linebackers Mark Barron and Cory Littleton (58) defend during the NFC Championship Game, Sunday, Jan. 20, 2019, in New Orleans. Los Angeles Rams running back Todd Gurley (30) warms up prior to the NFC Championship Game against the New Orleans Saints, Sunday, Jan. 20, 2019, in New Orleans. New Orleans Saints wide receiver Michael Thomas (13) and tight end Garrett Griffin (45) celebrate during the NFC Championship Game against the Los Angeles Rams, Sunday, Jan. 20, 2019, in New Orleans. Los Angeles Rams wide receiver Josh Reynolds (83) runs the ball as New Orleans Saints outside linebacker Demario Davis (56) defends during the NFL NFC Championship football game, Sunday, Jan. 20, 2019 in New Orleans. Los Angeles Rams quarterback Jared Goff (16) throws a pass during the NFC Championship Game against the New Orleans Saints, Sunday, Jan. 20, 2019, in New Orleans. New Orleans Saints middle linebacker Alex Anzalone (47), outside linebacker Demario Davis (56) and defensive end Cameron Jordan (94) celebrate during the NFC Championship Game against the Los Angeles Rams, Sunday, Jan. 20, 2019, in New Orleans. Los Angeles Rams wide receiver Robert Woods (17) celebrates during the NFL NFC Championship football game against the New Orleans Saints, Sunday, Jan. 20, 2019 in New Orleans. New Orleans Saints quarterback Drew Brees (9) huddles with teammates prior to the NFC Championship Game against the Los Angeles Rams, Sunday, Jan. 20, 2019, in New Orleans. Los Angeles Rams running back Todd Gurley (30) arrives prior to the NFC Championship Game against the New Orleans Saints, Sunday, Jan. 20, 2019, in New Orleans. Former New Orleans Saints player Steve Gleason looks on prior to the NFC Championship Game against the Los Angeles Rams, Sunday, Jan. 20, 2019, in New Orleans.